Several Trichoderma strains have been reported to be effective in controlling plant diseases, and the action of fungal hydrolytic enzymes has been considered as the main mechanism involved in the antagonistic process. However, although Trichoderma strains were found to impair development of Crinipellis perniciosa, the causal agent of cocoa plant witches' broom disease, no fungal strain is available for effective control of this disease. We have then undertaken a program of construction of hydrolytic enzyme-overproducing Trichoderma strains aiming improvement of the fungal antagonistic capacity. The protease of an indian Trichoderma isolate showing antagonistic activity against C. perniciosa was purified to homogeneity and characterized for its kinetic properties and action on the phytopathogen cell wall. A protease produced by the Trichoderma harzianum isolate 1051 was purified to homogeneity by precipitation with ammonium sulfate followed by hydrophobic chromatography. The molecular mass of this protease as determined by SDS-polyacrylamide gel electrophoresis was about 18.8 kDa. Its N-terminal amino acid sequence shares no homology with any other protease. The purified enzyme substantially affected the cell wall of the phytopathogen C. perniciosa. Western-blotting analysis showed that the enzyme was present in the culture supernatant 24 h after the Trichoderma started to grow in casein-containing liquid medium. The capacity of the Trichoderma harzianum protease to hydrolyze the cell wall of C. perniciosa indicates that this enzyme may be actually involved in the antagonistic process between the two fungi. This fact strongly suggest that hydrolytic enzyme over-producing transgenic fungi may show superior biocontrol capacity. Since the pioneering work of Weindling and Fawcett on the use of Trichoderma strains to control damping-off caused by Rhizoctonia solani Kühn in citrus, considerable attention has been focused over the past 20 years on the isolation of fungal antagonist that could be as effective as pesticides in the repression of fungal pathogens . However, the molecular basis of biological control is not clearly understood. Proposed mechanisms resulting in biocontrol are competition for the substrate , the ability to colonize the niche favored by the pathogen, antagonism by antibiotics [3, 4] and the action of cell wall-degrading enzymes . It has been claimed that a battery of antibiotic substances produced by Trichoderma spp. are responsible for their antagonistic properties . On the other hand, chitinolytic enzymes produced by Trichoderma harzianum Rifai have been suggested as being responsible for the observed antifungal activity [6, 7]. Indirect evidence suggested that T. harzianum antagonize first and foremost by antibiosis leading to cell death, followed by degradation of the cell wall by chitinolytic enzymes . In addition, T. harzianum growing in liquid medium containing Botrytis cinerea cell wall produced considerable proteolytic activity , which was suggested to be involved in the antagonistic process. This possibility is further supported by the finding that an alkaline protease (prb1) is also induced in the presence of Rhizoctonia solani cell wall . Cocoa plant witches' broom is a serious disease caused by the hemibiotrophic fungus Crinipellis perniciosa. This fungus is currently causing severe damage to many cocoa plantations in South America. Phytosanitation and, to a lesser extent, chemical control are recommended in certain situations but are not effective and/or practical in all circumstances. Nevertheless, some Trichoderma spp isolates were previously found to control the development of C. perniciosa in field conditions and, consequently, to control the disease (José L. Bezerra, personal comm.). Production of hydrolytic enzymes by two of these fungal isolates (1051 and TVC) in liquid medium was then studied . Both fungi were found to produce substantial amounts of chitinases, N-acetylglucosaminidase, β-glucanases, cellulases, amylases and proteases. One chitinase and one amylase produced by the isolate 1051 were purified and characterized [10, 11]. The chitinase drastically affected the C. perniciosa cell wall in vitro, indicating that this enzyme may play an important role during the antagonistic process between T. harzianum and the phytopathogen C. perniciosa. Nevertheless, substantial information provides support for the concept that the extraordinary capacity of T. harzianum to attack the structures of phytopathogens is related to the synergistic action of hydrolytic enzymes including chitinases, glucanases, lipases and proteases . The properties of several hydrolases produced by fungi showing antagonistic capacity against the causal agent of cocoa plant witches' broom disease are now being investigated in this laboratory [10–13]. Here, we report the purification and some properties of one protease produced by T. harzianum 1051 grown in liquid medium containing casein as carbon source. Trichoderma harzianum, isolate 1051, was obtained from the collection of the Centro Nacional de Pesquisa de Monitoramento e Avaliação de Impacto Ambiental (CNPMA/EMBRAPA, Jaguariuna, SP, Brasil). The phytopathogen Crinipellis perniciosa was kindly provided by Dr. José Luiz Bezerra from CEPLAC/Ilheus, BA, Brasil. Both fungi were maintained by serial passages in Bacto-dextrose-agar medium. For enzyme production, T. harzianum was grown in TLE liquid medium as previously described , for 72 h at 28°C. Protease activity was assayed using a reaction system containing 500 μL of a 1% solution of hammarstein casein dissolved in 0.1 M HEPES buffer, pH 8.0, 250 μL of the HEPES buffer, and 0–250 μL of enzyme solution. Reaction was conducted for 20 min at 37°C and stopped by addition of 1.25 mL of 10% TCA, incubation (40 min) on ice and centrifugation (10 min, 5,000 rpm). The absorbance of the supernatant was determined at 280 nm. One unit of proteolytic activity corresponds to the amount of enzyme required to cause an increase of 1.0 A280 nm unit in the absorbance of the supernatant within 20 min. All enzyme assays were carried out in triplicate. In all cases, the standard deviation values were smaller than 3% of the mean values. Four 1 liter-erlenmeyer flasks, each containing 500 mL of TLE liquid culture medium [0.1 % bactopeptone; 0.03 % urea; 0.2 % KH2PO4; 0.14 % (NH4)2SO4; 0.03 % MgSO4.7H2O; 0.03 % CaCl2.6H2O; 1 mL of 0.01 % trace elements solution (Fe2+, Mn2+, Zn2+, and Co2+), 0.02 % glucose, pH 5.5) containing 0.5% casein] were inoculated with 2 × 107 spores of T. harzianum 1051 and the culture incubated for 72 h with agitation (120 rpm) at 28°C. The culture supernatant were then collected by filtration on filter paper and the proteins precipitated with 20% ammonium sulfate. This was followed by centrifugation at 28.800 g for 30 min, and reprecipitation of the supernatant with 60% ammonium sulfate. The resulting pellet (hereafter called crude enzyme extract) was ressuspended in 50 mM sodium phosphate buffer, pH 5.0, and loaded on a Phenyl-Sepharose column (10 × 1.8 cm) equilibrated with the phosphate buffer. Proteins were then eluted with a negative linear gradient formed with 50 mL of 50 mM sodium phosphate buffer, pH 5.0, containing 1.0 M ammonium sulfate, and 50 ml of the same buffer. Samples of 3.0 ml were collected at a flow rate of 54 mL/h. Protease samples were submitted to electrophoresis in polyacrylamide gels under denaturing conditions, according to Laemmli . Proteins present in the gels were stained with silver reagent according to the method of Blum et al.. For immunoblotting analysis, proteins present in the SDS-polyacrylamide gels were transferred to a nitrocellulose membrane  using a LKB Multiphor II (Pharmacia). The membranes were then incubated overnight with 2 % skimmed milk solution at 4°C, and the proteins immunodetected using the polyclonal mouse antibody specific for the T. harzianum 1051 protease, alkaline phosphatase-linked mouse anti-IgG antibody (Sigma Chem.Co) and color development reagent (132 μL of nitro blue tetrazolium + 66 μL of 5-bromo-4-chloro-3-indolyl dissolved in 20 mL of phosphate buffered saline). For production of the mouse polyclonal antibody against the T. harzianum 1051 protease, three mices received intraperitoneally at 20-day intervals three doses (30 μg each) of the purified protease. The first injection was given with complete Freund's adjuvant, the second with incomplete Freund's adjuvant and the third without any adjuvant. The animals were bled 45 days after the first injection and serum was collected by centrifugation after blood clotting. The N-terminal amino acid sequence of the Trichoderma 1051 protease was determined by the Edman degradation method using an automatic sequencer (Applied Biosystems 477A Automatic Protein Sequencer) fitted on line to a 120 A PTH-analyzer. Comparison of the protease amino acid sequence with other proteins was done using the Swiss-Prot databank. Disks (5 mm) of solid culture medium containing C. perniciosa mycelium were placed in microcentrifuge tubes containing 1 mL of either T. harzianum 1051 culture supernatant showing proteolytic activity (220 U/mL) or the corresponding purified protease (75 U/mL). After incubation for 0, 24 and 48 h at 37°C, the supernatants were used for determination of reducing sugars by the dinitrosalicylic acid method (DNS assay) according to Miller , glucose by the glucose oxidase method  and protein by a simplification of the method of Lowry et al.. The C. perniciosa mycelium disks submitted to the action of the protease samples were then fixed for 2 h at 4°C in 2% (v/v) glutaraldehyde and 2% (w/v) paraformaldehyde buffered with 0.05% sodium cacodylate buffer, pH 7.2, and postfixed in 1% (w/v) osmium tetroxide in the same buffer. The specimens were washed with buffer and dehydrated in 30–100% (v/v) acetone, critical-point dried in CO2 and sputter-coated with gold. Materials were examined microscopically at an accelerating voltage of 10.0 kV. T. harzianum 1051 growing in casein-containing liquid medium produces substantial proteolytic activity as previously reported . The supernatant of T. harzianum 1051 cultures were then used to purify the protein showing proteolytic activity against casein. Upon freeze-drying of the culture supernatant, there was no significant loss of enzyme activity. The proteases present in the freeze-dried culture supernatant reconstituted with water were only slightly precipitated with ammonium sulfate at the concentration of 20%, but was fully precipitated with this salt at the final concentration of 60 % at pH 5.0. We then used the enzyme sample obtained by precipitation with 20 % and 60 % ammonium sulfate for further purification of the enzyme using a Phenyl-Sepharose column (Fig. 1). The proteins were eluted as several peaks both before and after the ammonium sulfate gradient was started. Nevertheless, the bulk proteolytic activity was eluted as a single peak, i.e., only the proteins eluted with an ammonium sulfate concentration of 0.23–0.16 M (fractions 28–37) were active against casein. 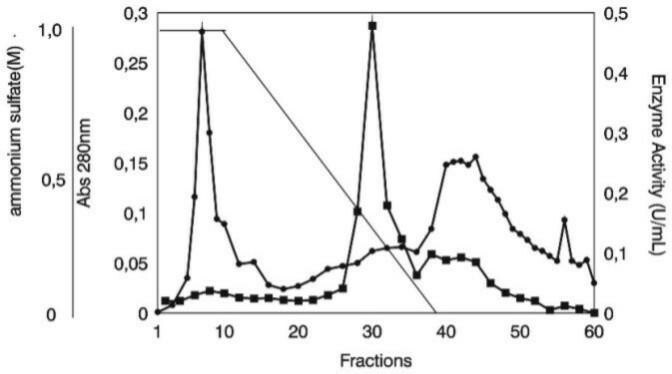 The enzyme sample resulting from pooling of fractions 30–37 contained a single protein as demonstrated by SDS-PAGE  analysis (Fig. 2). The protein fractions eluted from the column after the ammonium sulfate gradient showed very low proteolytic activity and several protein species, as analyzed by SDS-PAGE (not shown). The summary of the purification protocol indicated that the enzyme was purified 4.06-fold (Tab. 1). The higher amount of total protein in the pellet resulting from precipitation of the freeze-dried culture supernatant with ammonium sulfate must be resulting from artifact, since this salt may react with Lowry reagents. The molecular mass of the enzyme was estimated to be 18.8 kDa (Fig. 2). Chromatography of the crude enzyme preparation of Trichoderma harzianum 1051 on a Phenyl-Sepharose column. ■ protease activity; ● Absorbance at 280 nm; — (NH4) 2SO4 negative gradient. SDS-PAGE of the protease from Trichoderma harzianum 1051 purified on a Phenyl-Sepharose column. Mw, molecular weight standards; A, purified protease. Proteins were silver stained. Summary of the purification protocol of the protease produced by Trichoderma harzianum 1051. *Freeze-dried culture medium ressuspended with 20 ml of 50 mM phosphate buffer, pH 5.0; **pellet resulting from precipitation of the freeze-dried material, with 60% (NH4)2 SO4 and resuspended with 3 ml of the phosphate buffer; *** Protease sample (Fig. 1, fractions 30–37) resulting from chromatography of the crude enzyme on a phenyl-Sepharose column. The effect of the pH on the protease activity was determined at the pH range of 7.0–10.0. At this range, maximal activity was determined at the pH values of 7.0 and 8.0, but substantial proteolytic activities were encountered at pH 9.0 and 10.0 (Fig. 3A). The effect of acidic pH (<7.0) could not be determined, since the casein precipitates at acid pH conditions. This fact has made it difficult to determine the optimal pH for the purified protease, and the presented data do not exclude the possibility that the enzyme is mostly active at pH values lower than 7.0. 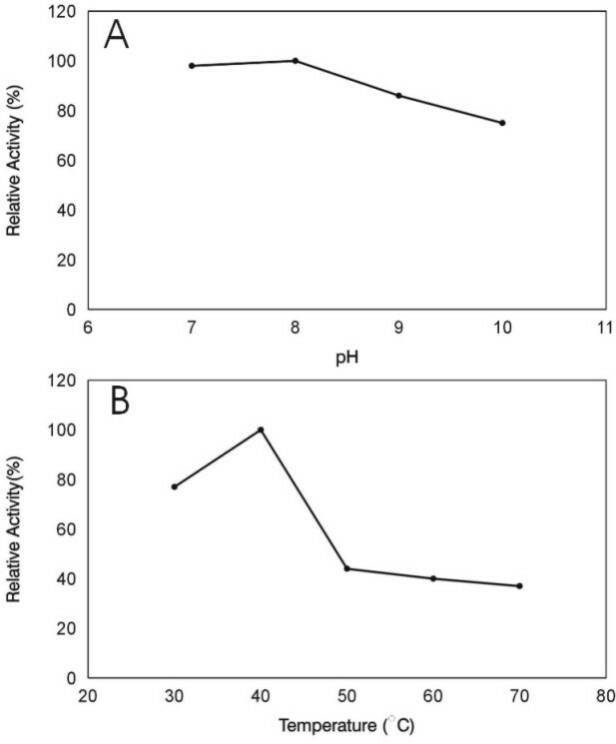 The optimal pH value determined for the proteolytic activity produced by T. viride in mixed culture with Sclerotium rolfsii in soil, was 6.0 , this value being lower than the optimal pH determined for the proteolytic activities from Trichoderma virens, and for the extracellular proteases from Streptomyces spp. G157  and S. pactum. The T. harzianum 1051 enzyme was mostly active at 37°C (Fig. 3B). This optimal temperature value is very close to the optimal temperatures determined for the proteases from Streptomyces spp. G157 , and S. pactum. The purified enzyme was only fairly stable at 37°C and pH 8.0 (not shown). It lost about 50% of its original activity after pre-incubation for 15 min at this temperature and pH, followed by the incubation with the substrate for 20 min at 37°C, as stated in materials and methods. The effect of pH (A) and temperature (B) on the activity of the purified protease from Trichoderma harzianum 1051. SDS-PAGE analysis revealed that several proteins were present in the culture supernatant of Trichoderma harzianum cultures grown on casein-containing medium (Fig. 4A). As casein has a molecular mass of about 23 kDa, the possibility that most of those proteins resulted from hydrolysis of the substrate present in the culture can be excluded, since most proteins have molecular mass values higher than 23 kDa. Western-blotting analysis using anti-protease antibodies raised in mice against the purified T. harzianum 1051 protease revealed that the antibodies recognized three proteins, indicating that the T. harzianum 1051 produces and secretes at least three proteases, one with a molecular mass of 18 kDa, and the other two with molecular masses of about 16–17 kDa (Fig. 4B). The 18.8 kDa protein recognized by the antibody corresponds to the protein purified and analyzed as above (Fig. 4B) corresponds to the purified protease as demonstrated in Fig. 2. Nevertheless, the possibility that the 17–18 kDa proteases result from proteolysis of the 18 kDa protein can not be excluded, since both proteins were present in the culture medium already 24 h after the beginning of culture. However, there is still the possibility that these two smaller proteins were recognized unspecifically by the anti-protease antibody. 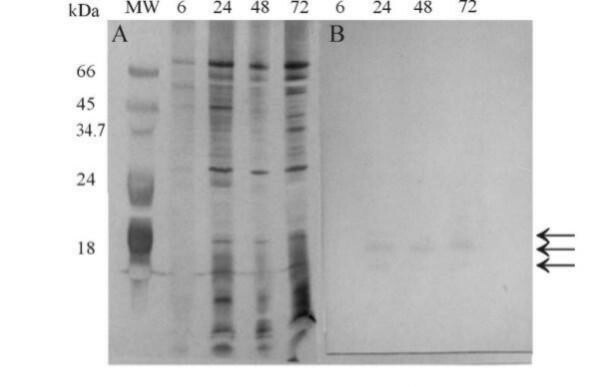 SDS-PAGE (A) and Western blot (B) analysis of the proteins present in the culture supernatant of Trichoderma harzianum 1051 grown in liquid medium containing 0.5% casein, for different growing times: 6 h, 24 h, 48 h, and, 72 h. Mw, molecular mass standards. Samples of culture medium containing about 100 μg of proteins were diluted in sample buffer and applied in the gel. Proteins in the SDS-PAGE were silver stained. The nitrocellulose membrane was developed with the polyclonal antibodies raised in mice against the Trichoderma harzianum 1051 purified protease, and alkaline phosphatase-conjugated anti-mouse IgG and the color developing reagents nitro blue tetrazolium and 5-bromo-4-chloro-3-indolyl. The arrows indicate position of the 16, 17, and, 18.8 kDa proteins. The N-terminal amino acid sequence of the T. harzianum 1051 18.8 kDa protease (VPSTVWTVCP10) showed no homology with any other protease. It did, however, show homology of about 54%–75% with the amino acid sequences of proteins produced by Ectatomma tuberculatum, Ascaris lumbricoides, Escherichia coli, and Rhizobium meliloti. The effect of the proteolytic activity-exhibiting T. harzianum 1051 culture supernatant and of the corresponding purified protease (Fig. 1 and Fig. 2) on the C. perniciosa cell wall was tested by measuring the amounts of reducing sugar and protein produced during incubation of the enzyme samples with the phytopathogen mycelium (Tab. 2). As much as 0.202 μg of protein/μL of reaction mixture, as measured by the method of Lowry et al. were present in the reaction mixture 48 h after the beginning of the period of incubation of the purified native enzyme with the Crinipellis mycelium (Tab. 2). At the same time, no protein was detected in the reaction mixture containing heat-denatured enzyme. The purified native and the denatured enzyme produced nor reducing sugar neither glucose. However, these products were present in the reaction mixture containing crude enzyme extract and the phytopathogen mycelium. This is probably due to the presence of other enzymes besides the protease. The action of the protease on the C. perniciosa mycelium was further confirmed by SEM analyses which revealed that the purified enzyme could hydrolyze the cell wall of the phytopathogenic fungus C. perniciosa as soon as 48 h after contact (Fig. 5B). As expected, no hydrolytic effect was observed for the denatured enzyme on the phytopathogen mycelium (Fig. 5A). This finding supports previous observation that the T. harzianum isolate 1051 controls witches' broom disease in the field (J. L. Bezerra, personal comm.) and is able to impair the growth of C. perniciosa when both fungi are allowed to grow on the same plate containing solid medium (dual culture). The most common event involved in the antagonistic process is perforation of the phytopathogen cell wall by lytic enzymes produced by the antagonist . The effects of purified Trichoderma chitinase on the cell wall of Rhizoctonia solani and Sclerotium rolfsii and on C. perniciosa mycelium  were reported before supporting the involvement of hydrolytic enzymes in the antagonistic process. As a consequence, it has been claimed that hydrolytic enzymes and the genes encoding them may be useful for production of transgenic microorganisms with superior biocontrol capability and the development of transgenic plants with high resistance to pathogens . Further studies on molecular characterization of the protease produced by witches' broom disease-controlling T. harzianum, and studies about its possible participation in the antagonistic process are being carried out. 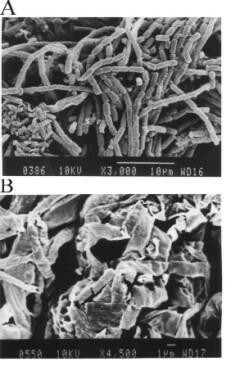 Scanning electron microscopy of the Crinipellis perniciosa mycelium treated for 48 h with native (A), and heat-denatured (B) Trichoderma harzianum 1051 purified protease. Amounts of reducing sugar, glucose and protein in the reaction medium containing Crinipellis perniciosa mycelium and crude enzyme extract, native and heat-denatured Trichoderma harzianum 1051 purified protease (75 U), or Trichoderma harzianum 1051 culture medium containing proteolytic activity (220 U). Hydrolysis was conducted for 48 hours. For assay of reducing sugar, glucose and protein see Materials and Methods. *μg of reducing sugar produced in 1 hour, **μg of glucose produced in 1 hour, ***μg of protein produced in 1 hour. The Trichoderma harzianum isolate 1051 which was previously shown to control cocoa plant witches' broom disease in the field, impairs growth of the disease agent, Crinipellis perniciosa, in solid medium. One protein with molecular mass of 18.8 kDa may account for the bulk of the proteolytic activity secreted by the Trichoderma during its growth in culture medium containing casein. 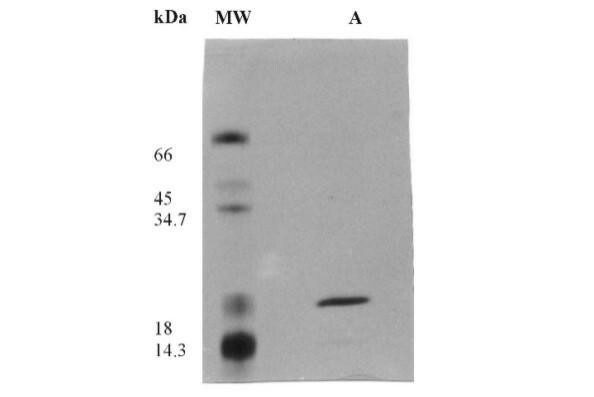 Mouse polyclonal antibody produced against the 18.8 kDa protease recognizes two other proteins with molecular masses of 16–17 kDa. The 18.8 kDa purified protease was able to hydrolyze the phytophatogen C. perniciosa cell wall in vitro, indicating that this enzyme may play a role in the antagonistic interaction between the Trichoderma and the phytopathogen. The authors are indet to Dr.Marcelo Valle de Sousa for sequencing of the protease and to Dr.Sonia Bao for the scanning electron microscopy works. JLM is grateful to the Conselho Nacional de Desenvolvimento Científico e Tecnológico do Brasil-CNPq for the post-doctoral fellowship.